The four Boy Scouts who were killed in a tornado that hit their western Iowa camp a year ago today are being remembered in a service at the rebuilt Little Sioux Scout Ranch in Harrison County. 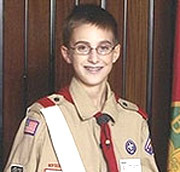 Lloyd Roitstein, executive director of the Boy Scouts of the Mid-America Council, says the boys are still missed. "We will always remember Aaron, Ben, Josh and Sam," Roitstein says. "There isn’t a day go by that we don’t think about them." He says the scouts are a close-knit group and the encouragement they have received from both inside and outside the group has been outstanding — and much-valued. Roitstein says, "The support that scouting and the families have had from around the country and around the world has been very gratifying." He says it’s hard to put into words the outpouring of support they have received, in addition to people putting in physical labor helping to rebuild the camp. He says they’ve had "young children and organizations sending in notes, letters and unsolicited money and people coming out to Little Sioux Scout Ranch every weekend to support it every way possible." A leadership camp is underway at the camp and many of those who survived last year’s storm are taking part. Roitstein says to mark the anniversary and to honor and remember those who passed away, scouts from across the country were being asked to fly their flags at half-staff today. He says, "We’ve asked scouts, scouters, scout councils across the country and everyone else who wants to, to fly their flag at half staff, that’ll happen throughout the country." Roitstein says he’s still very impressed with how the boys handled the crisis that night as they used their first aid skills to treat each others’ injuries. He says it shows the boys are really men and it proves the value of scout training.